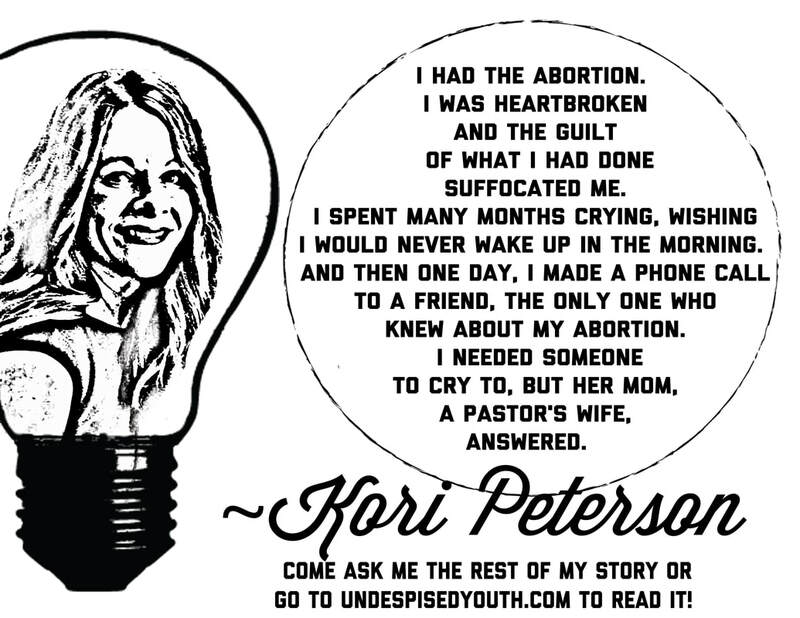 When I was 20 years old, I had an abortion and it ruined my life so much that I wanted to die. In high school I was a good girl, a cheerleader, a dancer, involved in various Christian clubs and the youth group at my church. Even though I was faithful in my church attendance and commitment to be a good Christian, I never really had an established or deep relationship with God. I never read my Bible and when I did read it, I didn't understand what I was reading. Out of high school, I got involved with a guy. We were just friends at first and I didn't think anything would happen because I thought I was strong enough to hold him off. But the Bible says, “Let him who thinks he stands take heed lest he fall.” (1 Cor. 10:12) A couple of months later he scheduled an appointment for me at a local abortion clinic. When it was all over and I was devastated, he dumped me. Because I surrendered my life to Jesus, and because of His healing hand in my life and my willingness to share about it, I am navigating a life course I never imagined. I have shared my story on radio shows and news articles across the country. He has provided so many unexpected and exciting opportunities. We have the potential to not just simply exist. We have the potential to not be mediocre. We have the potential to not be a product of our bad choices. We have the potential to make a difference in the world. Through forgiveness. Through talents. Through kindness. Through courage. Through intentionality. Through Jesus. It is wholly up to you - and to me - what we will do with the days, the hours, the minutes we are given. We must surrender our hearts and our will to God. Surrender to Jesus. Live for Him. And let him make a life of beauty and purpose through you.